The Rightline Gear SUV Tent lets you camp without leaving all the luxuries of home behind. 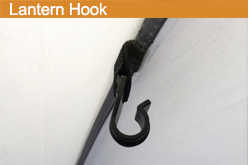 The adjustable nature of the vehicle sleeve allows the tent to connect to the back of any SUV, minivan, crossover, wagon, or pick-up truck with cap, WITH or WITHOUT a roof rack. The tent works for vehicles with a rear hatch or a rear barn door. The SUV Tent easily disconnects from your vehicle, allowing you to go about the day’s adventures. 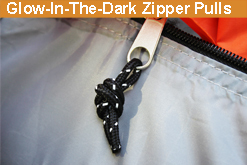 Simply tie up the vehicle sleeve with the dowel and loop fasteners. Use the back of your vehicle as a sleeping area, for storage, or to power electronic devices. 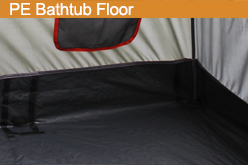 Use the SUV Tent as a changing room or as a sleeping area for family or friends. 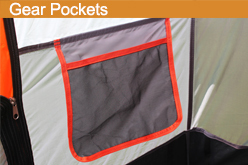 This tent has room to spare, so invite everyone along on your next camping outing. Remember, the Rightline Gear SUV Tent comes at a fraction of the cost of any camper! The SUV Tent is outfitted with (2) gear pockets, a lantern hanging hook, glow-in-the-dark zipper pulls, and a PE bathtub floor.